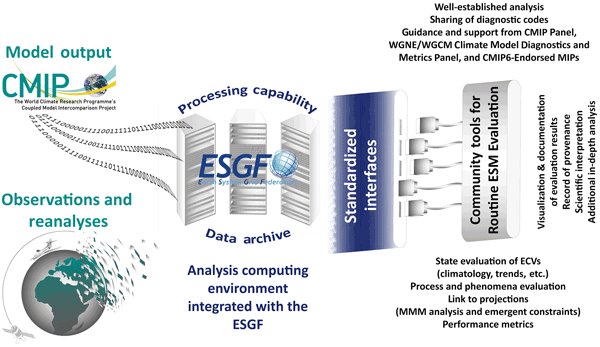 We present an overview of climate feedbacks for Earth system components currently included in state-of-the-art Earth system models (ESMs) and discuss the challenges to evaluate and quantify them. The target group for this article includes generalists with a background in natural sciences and an interest in climate change as well as experts working in interdisciplinary climate research. 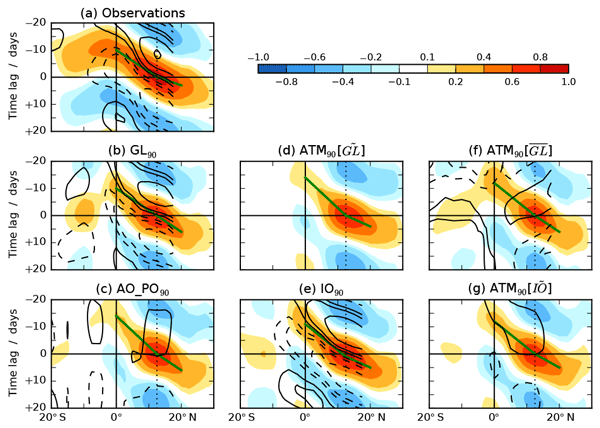 This study places aircraft trace gas measurements from within the Asian summer monsoon anticyclone into the context of regional, intra- and interannual variability. We find that the processes reflected in the measurements are present throughout multiple simulated monsoon seasons. 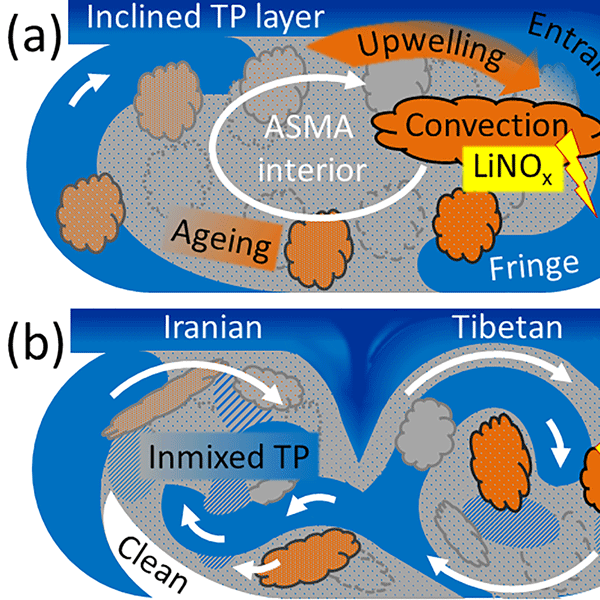 Dynamical instabilities, photochemical ozone production, lightning and entrainments from the lower troposphere and from the tropopause region determine the distinct composition of the anticyclone and its outflow. We have designed a set of climate model experiments called the Aerosol Chemistry Model Intercomparison Project (AerChemMIP). These are designed to quantify the climate and air quality impacts of aerosols and chemically reactive gases in the climate models that are used to simulate past and future climate. We hope that many climate modelling centres will choose to run these experiments to help understand the contribution of aerosols and chemistry to climate change. 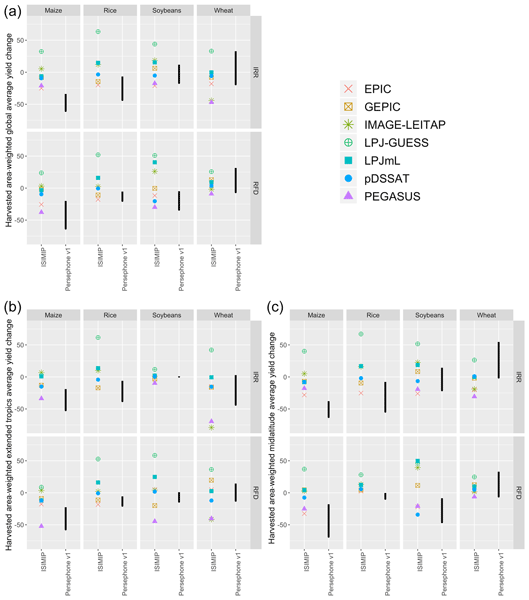 We argue that the CMIP community has reached a critical juncture at which many baseline aspects of model evaluation need to be performed much more efficiently to enable a systematic and rapid performance assessment of the large number of models participating in CMIP, and we announce our intention to implement such a system for CMIP6. At the same time, continuous scientific research is required to develop innovative metrics and diagnostics that help narrowing the spread in climate projections. The Scenario Model Intercomparison Project (ScenarioMIP) will provide multi-model climate projections based on alternative scenarios of future emissions and land use changes produced with integrated assessment models. The design consists of eight alternative 21st century scenarios plus one large initial condition ensemble and a set of long-term extensions. Climate model projections will facilitate integrated studies of climate change as well as address targeted scientific questions. Using ozone and PM2.5 concentrations from the ACCMIP ensemble of chemistry-climate models for the four Representative Concentration Pathway scenarios (RCPs), together with projections of future population and baseline mortality rates, we quantify the human premature mortality impacts of future ambient air pollution in 2030, 2050 and 2100, relative to 2000 concentrations. We also estimate the global mortality burden of ozone and PM2.5 in 2000 and each future period. 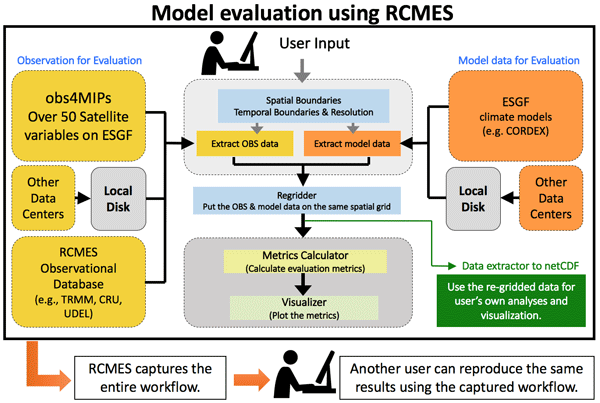 A community diagnostics and performance metrics tool for the evaluation of Earth system models (ESMs) in CMIP has been developed that allows for routine comparison of single or multiple models, either against predecessor versions or against observations. High resolution measurements of maritime clouds are relatively scarce. Airborne cloud radar, microwave radiometer and dropsondes observations are used to expand these data. 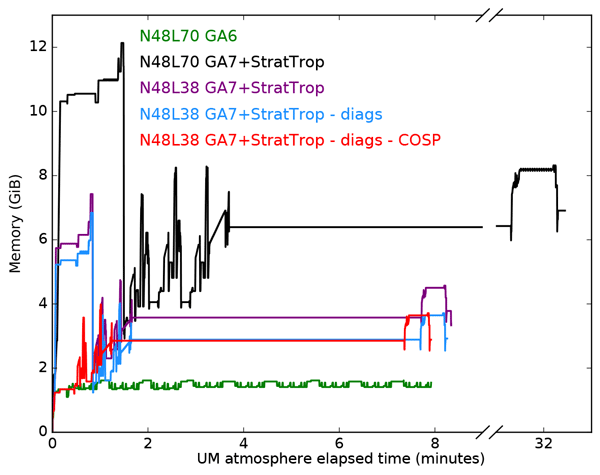 The measurements are unified into one data set to enable easy joint analyses of several or all instruments together to get insight into cloud properties and atmospheric state. The data set contains measurements from four campaigns between December 2013 and October 2016 over the tropical and mid-latitude Atlantic. 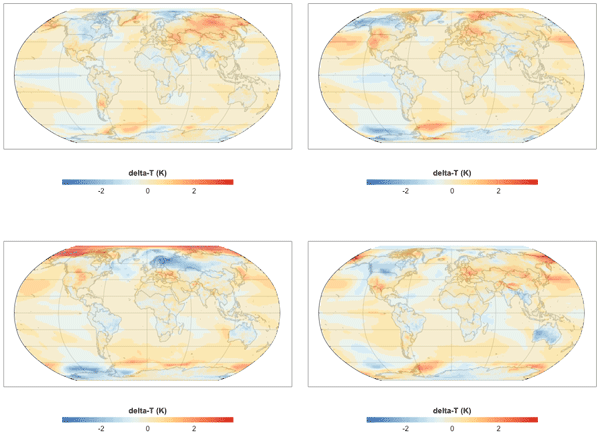 Model experiments show that changing the sense of Earth's rotation has relatively little impact on the globally and zonally averaged energy budgets but leads to large shifts in continental climates and patterns of precipitation. The retrograde world is greener as the desert area shrinks. Deep water formation shifts from the North Atlantic to the North Pacific with subsequent changes in ocean overturning. 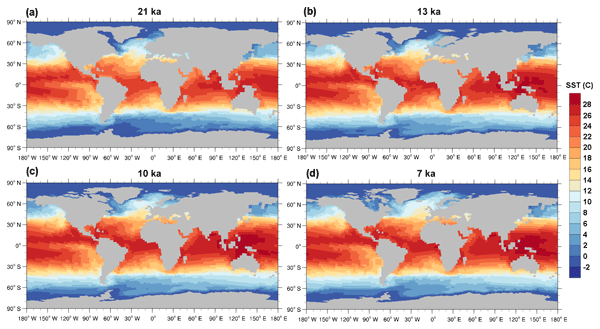 Over large areas of the Indian Ocean, cyanobacteria dominate over bulk phytoplankton. One of the most important parameters in climate science is the equilibrium climate sensitivity (ECS). Estimates of this quantity based on 20th-century observations suggest low values of ECS (below 2 °C). We show that these calculations may be significantly in error. Together with other recent work on this problem, it seems probable that the ECS is larger than suggested by the 20th-century observations. RCEMIP, an intercomparison of multiple types of numerical models, is proposed. In RCEMIP, the climate system is modeled in an idealized manner with no spatial dependence of boundary conditions (i.e., sea surface temperature) or forcing (i.e., incoming sunlight). This set of simulations will be used to investigate how the amount of cloudiness changes with warming, how the clustering of clouds changes with warming, and how the state of the atmosphere in this idealized setup varies between models. We present a formal data model for version 1.6 of the CF (Climate and Forecast) metadata conventions that provide a description of the physical meaning of geoscientific data and their spatial and temporal properties. We describe the CF conventions and how they lead to our CF data model, and compare it other data models for storing data and metadata. We present cf-python version 2.1: a software implementation of the CF data model capable of manipulating any CF-compliant dataset. 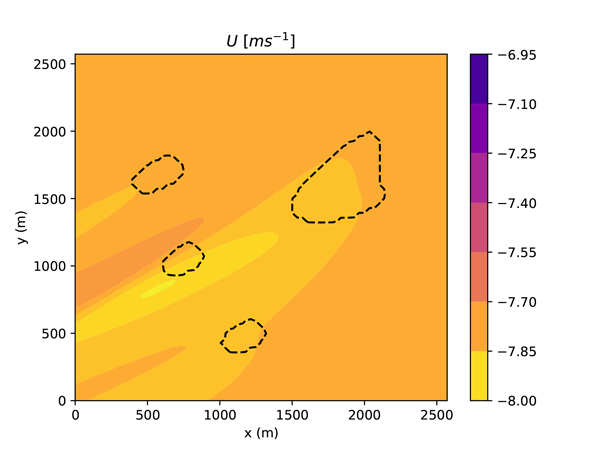 High-resolution multi-week simulations of a measurement campaign are evaluated with respect to mean boundary layer quantities and turbulence statistics. Two models are used in a semi-idealized setup through forcing, with output from a coarser-scale model to account for the larger-scale conditions. The boundary layer depth is in principal agreement with observations. 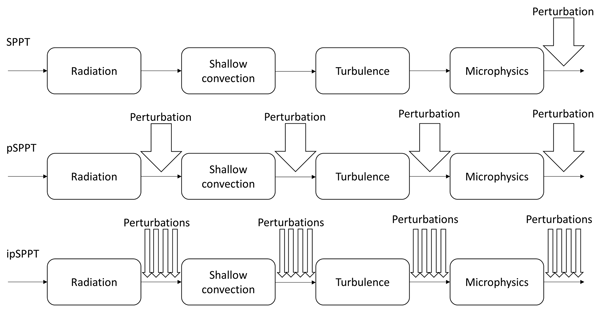 Turbulence statistics like variance profiles agree satisfactorily with measurements. A simple analytic description of aerosol optical properties and their main effects on clouds is developed and described. The analytic description is easy to use and easy to modify and should aid experimentation to help understand how aerosol radiative and cloud interactions effect climate and circulation. The climatology is recommended for adoption by models participating in the sixth phase of the Coupled Model Intercomparison Project. The Cloud Feedback Model Intercomparison Project (CFMIP) aims to improve understanding of cloud-climate feedback mechanisms and evaluation of cloud processes and cloud feedbacks in climate models. CFMIP also aims to improve understanding of circulation, regional-scale precipitation and non-linear changes. CFMIP is contributing to the 6th phase of the Coupled Model Intercomparison Project (CMIP6) by coordinating a hierarchy of targeted experiments with cloud-related model outputs. Recent progress in computing power has enabled climate models to simulate more processes in detail and on a smaller scale. Here we present a common protocol for these high-resolution runs that will foster the analysis and understanding of the impact of model resolution on the simulated climate. These runs will also serve as a more reliable source for assessing climate risks that are associated with small-scale weather phenomena such as tropical cyclones. The Decadal Climate Prediction Project (DCPP) investigates our ability to skilfully predict climate variations from a year to a decade ahead by means of a series of retrospective forecasts. Quasi-real-time forecasts are also produced for potential users. In addition, the DCPP investigates how perturbations such as volcanoes affect forecasts and, more broadly, what new information can be learned about the mechanisms governing climate variations by means of case studies of past climate behaviour. 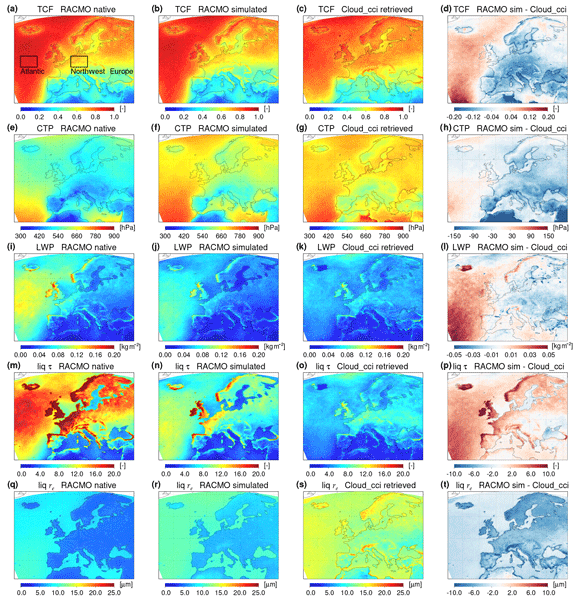 This paper describes an experimental protocol to understand the changes in energy balance (the "radiative forcing") that arise due to changes in atmospheric composition and why this value is not the same across climate models. The protocol includes a way to determine the total forcing to which each model is subjected, experiments designed at teasing out why certain errors occur, and experiments to identify any robust signals caused by atmospheric particles from human activities. The Ocean Model Intercomparison Project (OMIP) aims to provide a framework for evaluating, understanding, and improving the ocean and sea-ice components of global climate and earth system models contributing to the Coupled Model Intercomparison Project Phase 6 (CMIP6). 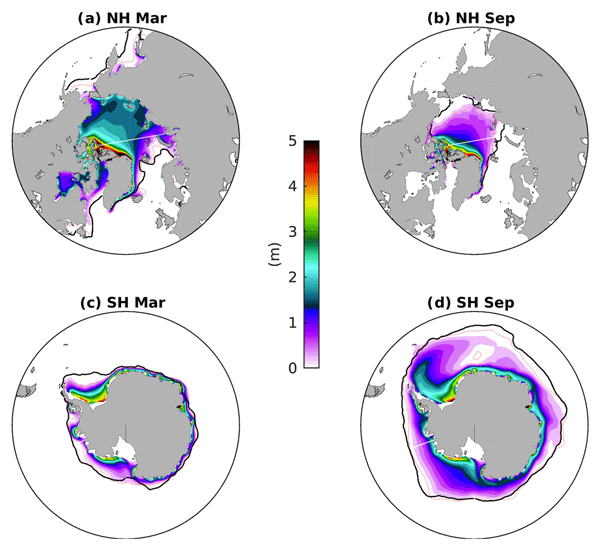 This document defines OMIP and details a protocol both for simulating global ocean/sea-ice models and for analysing their output. Here the High Altitude and LOng range research aircraft Microwave Package (HAMP) is introduced. The package consists of three passive radiometer modules with 26 channels between 22 and 183 GHz and a 36 GHz Doppler cloud radar. The manuscript describes the instrument specifications, the installation in the aircraft, and the operation. Furthermore, results from simulation and retrieval studies, as well as measurements from a first test campaign, are shown. To enable fair comparisons of clouds between climate models and the ESA Cloud_cci climate data record (CDR), we present a tool called the Cloud_cci simulator. The tool takes into account the geometry and cloud detection capabilities of the Cloud_cci CDR to allow fair comparisons. We demonstrate the simulator on two climate models. We find the impact of time sampling has a large effect on simulated cloud water amount and that the simulator reduces the cloud cover by about 10 % globally. 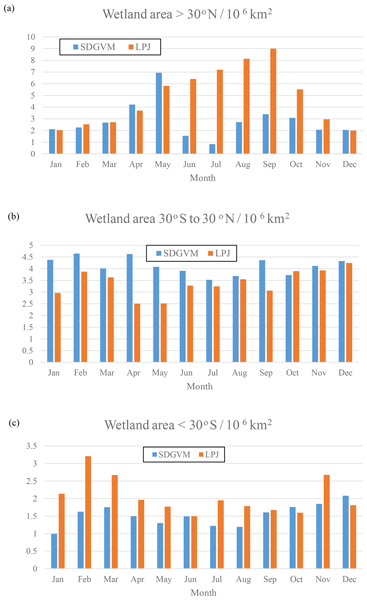 We present a simple model for assessing the cooling impacts of vegetation and water features (green and blue infrastructure) in urban environments. This model is designed to be computationally efficient so that those without technical knowledge or access to high-performance computers can use it. TARGET can be used to model average street-level air temperature at canyon to block scales (e.g. 100 m resolution). The model is carefully designed to provide reliable and accurate cooling estimates. 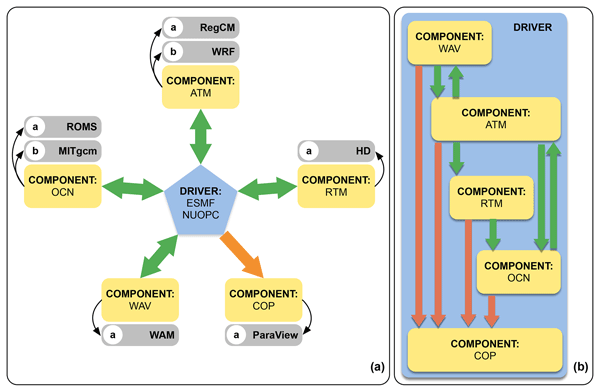 This paper describes GCAM v5.1, an open source model that represents the linkages between energy, water, land, climate, and economic systems. GCAM examines the future evolution of these systems through the end of the 21st century. It can be used to examine, for example, how changes in population, income, or technology cost might alter crop production, energy demand, or water withdrawals, or how changes in one region’s demand for energy affect energy, water, and land in other regions. Our results show how to halve the energy consumption of urban transportation by transforming the city. In this paper, we describe and evaluate a new variant of the Norwegian Earth System Model (NorESM). It is a computationally efficient model that is designed for experiments such as paleoclimate, carbon cycle, and large ensemble simulations. 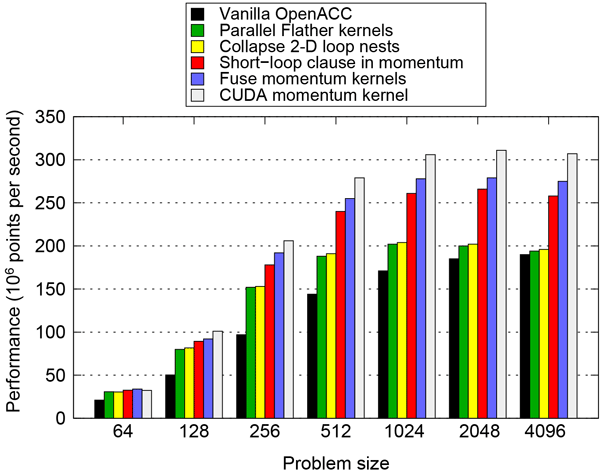 The model, with various recent code updates, shows improved climate performance compared to the CMIP5 version of NorESM, while the model resolution remains similar. Ensemble forecasting at the convection-permitting scale (< 3 km) requires new methodologies in representing model uncertainties. In this paper a new stochastic scheme is proposed and tested in the complex terrain of the Alps. In this scheme the tendencies of the physical parametrizations are perturbed separately, which sustains a physically consistent relationship between the processes. This scheme increases the stability of the model and leads to improvements in the probabilistic performance. 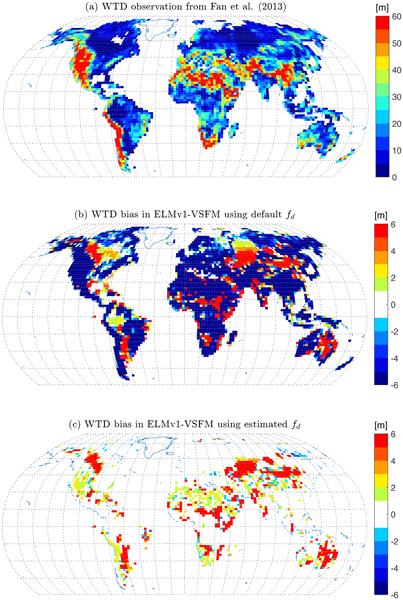 Demeter is a community spatial downscaling model that disaggregates land use and land cover changes projected by integrated human-Earth system models. However, Demeter has not been intensively calibrated, and we still lack a good knowledge about its sensitivity to key parameters and the parameter uncertainties. This paper aims to solve this problem. Tuning of uncertain parameters in global atmospheric general circulation models has extreme computational cost. 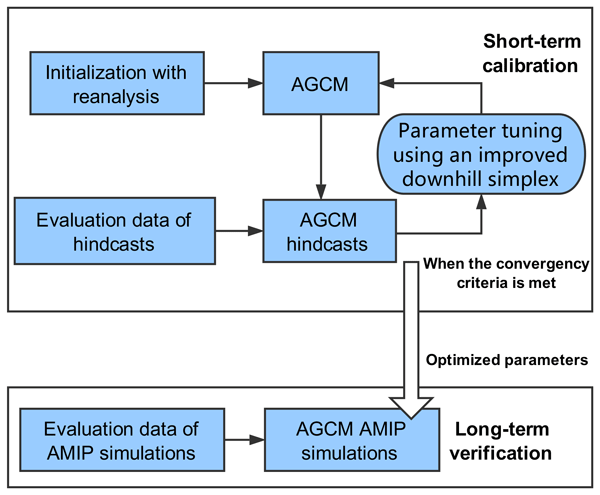 In this study, we provide an automatic tuning method by combining an auto-optimization algorithm with hindcasts to improve climate simulations in CAM5. The tuning improved the overall performance of a well-calibrated model by about 10 %. The computational cost of the entire auto-tuning procedure is just equivalent to a single 20-year simulation of CAM5. Earth system models (ESMs) integrate interactions of atmosphere, ocean, land, ice, and biosphere to estimate the state of regional and global climate under a variety of conditions. Past climate field reconstructions with deterministic ESMs through the assimilation of climate proxies need to consider the required high computations and model non-linearity. 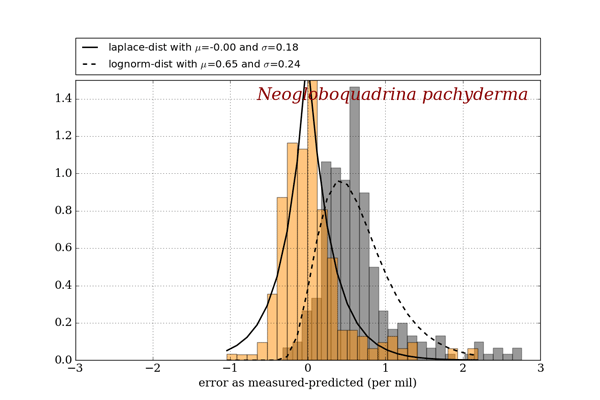 Our tests indicate that iterative schemes based on the Kalman filter and careful sensitivity analysis are adequate for approaching the problem. The Regional Arctic System Model version 1 (RASM1) was recently developed for high-resolution simulation of the coupled atmosphere–ocean–sea ice–land system in the Arctic. 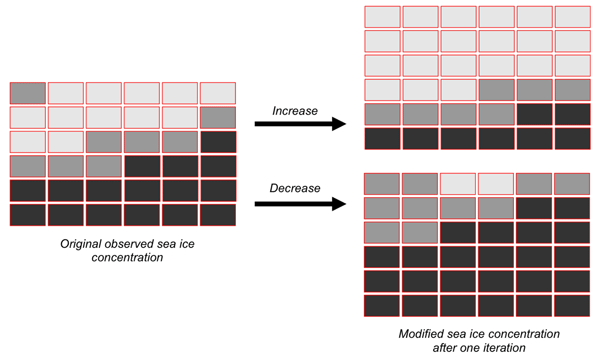 Its simulation of the atmosphere–land–ocean–sea ice interface is evaluated by using the spread in recent reanalyses and a global Earth system model as baselines. 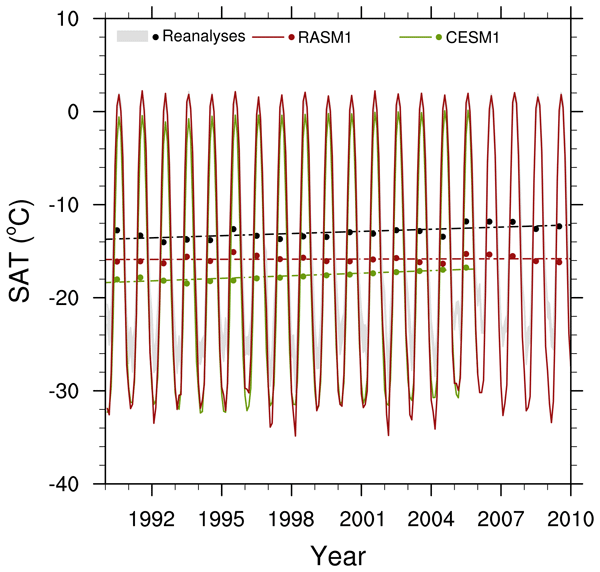 Such comparisons reveal that RASM1 simulates precipitation well and improves the simulation of surface fluxes over sea ice. Cloud processes occur at scales ranging from few micrometers to hundreds of kilometers. Their representation in global climate models and its fidelity are thus sensitive to the choice of spatial resolution. 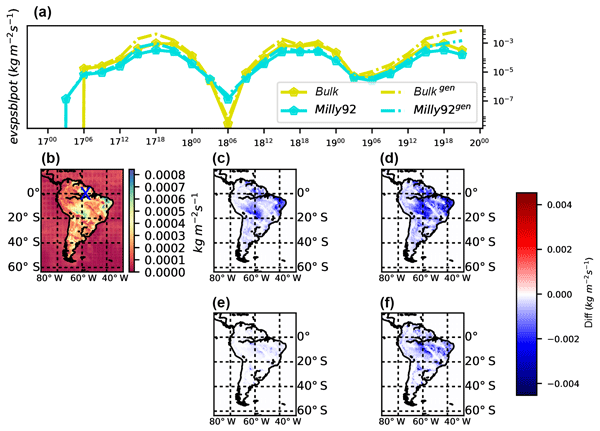 Here, cloud radiative effects simulated by models are evaluated using satellite dataset, with focus on investigating the sensitivity to the spatial resolution. The evaluations are carried out using two approaches: the traditional statistical comparisons and the process oriented evaluation. We investigate the simulation of the Indian monsoon in the UK Met Office climate model. We simulate both the atmosphere and the ocean (which can interact with each other) and compare against simulating the atmosphere alone. Atmosphere–ocean interactions make the modelled average monsoon climate less realistic because the sea surface temperature is wrong in the model, but the interactions make individual rain events, in which storms propagate northwards over the Indian Ocean, more realistic. We have devised a novel way to couple a climate model to an ice-sheet model. Usually, climate models are too slow to simulate more than a few centuries, whereas our new model set-up can simulate a full 120 000-year ice age in about 12 h. This makes it possible to look at the interactions between global climate and ice sheets on long timescales, something which is relevant for both research into past climate and future projections. This paper presented main progress of BCC model transition from CMIP5 to CMIP6, especially in both model resolution and its physics. 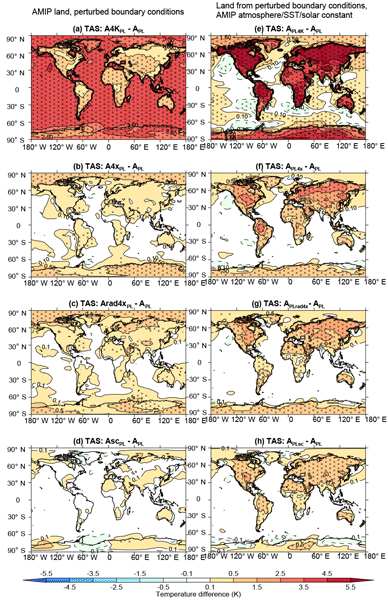 Compared to BCC CMIP5 models, BCC CMIP6 model show significant improvements for historical simulations in many aspects including: tropospheric air temperature and circulation at global and regional scale in East Asia, climate variability at different time scales such as QBO, MJO, diurnal cycle of precipitation, and long-term trend of global air temperature. During the Last Glacial Maximum, many rivers were blocked by the presence of large ice sheets and thus found new routes to the sea. This resulted in changes in the pattern of freshwater discharge into the oceans and thus would have significantly affected ocean circulation. Also, rivers found routes across the vast exposed continental shelves to the lower coastlines of that time. We propose a model for such changes in river routing suitable for use in wider models of the last glacial cycle. Climate change is expected to have a significant impact on the Earth's weather, ice caps, land surface, and ocean. Computer models of the Earth system are the only tools available to make predictions about how the climate may change in the future. However, in order to trust the model predictions, we must first demonstrate that the models have a realistic description of the past. 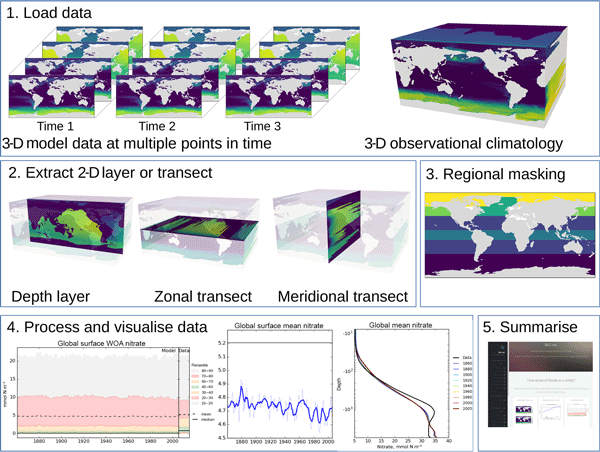 The BGC-val toolkit was built to rapidly and simply evaluate the behaviour of models of the Earth's oceans. Most existing global land surface models used to study impacts of climate change on water resources routinely use different models for near-surface unsaturated soil and the deeper groundwater table. We developed a model that uses a unified treatment of soil hydrologic processes throughout the entire soil column. 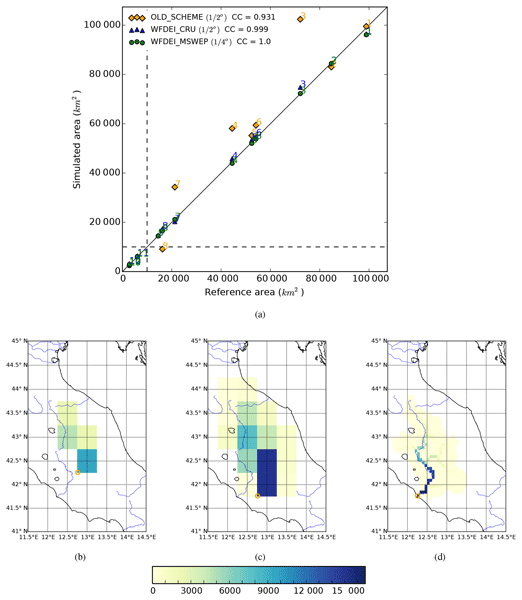 Using a calibrated drainage parameter, the new model is able to correctly predict deep water table depth as reported in an observationally constrained global dataset. In the real world the atmosphere, oceans and land surface are closely interconnected, and yet the prediction systems used for weather and ocean forecasting tend to treat them in isolation. This paper describes the third version of a regional modelling system which aims to represent the feedback processes between sky, sea and land. The main innovation introduced in this version enables waves to affect the underlying ocean. Coupled results from four different month-long simulations are analysed. 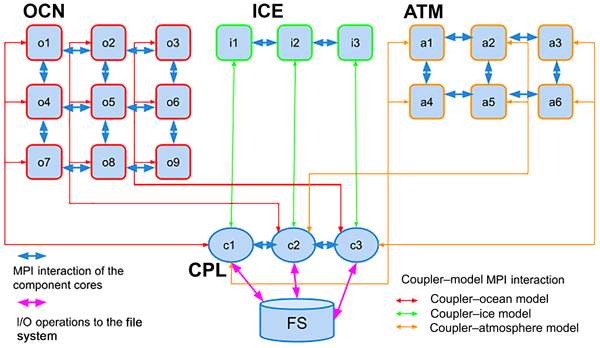 We present a new version of the Compact Modeling Framework (CMF3.0) developed for the software environment of stand-alone and coupled global geophysical fluid models. The CMF3.0 is designed for use on high- and ultrahigh-resolution models on massively parallel supercomputers. A new aerosol treatment is described and tested in a global climate model. With updated emissions, aerosol chemistry, and microphysics compared to its predecessor, black carbon (BC) mass concentrations aloft better fit observations, surface concentrations of BC and sea salt are less biased, and sulfate and mineral dust slightly more, while the results for organics are inconclusive. Man-made aerosols now yield a stronger cooling effect on climate that is strong compared to results from IPCC. Data from the First ISLSCP Field Experiment, 1987–9, is used to assess how well the JULES land-surface model simulates water stress in tallgrass prairie vegetation. We find that JULES simulates a decrease in key carbon and water cycle variables during the dry period, as expected, but that it does not capture the shape of the diurnal cycle on these days. These results will be used to inform future model development, as part of wider evaluation efforts. 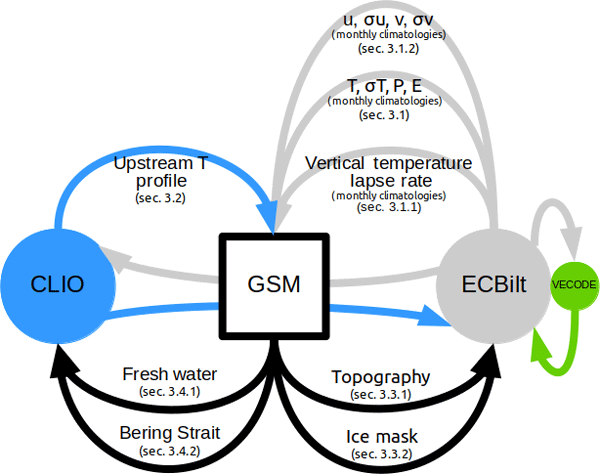 We describe a new coupling between the Glacial Systems Model and the LOVECLIM intermediate complexity climate model. The coupling is distinguished from that of previous studies by greater completeness and accuracy, with the intent of capturing the major feedbacks between ice sheets and climate on glacial cycle timescales. The fully coupled model will be used to examine the ice/climate phase space of past glacial cycles. 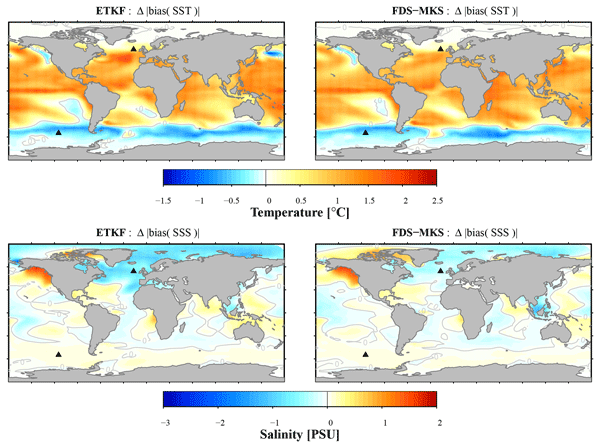 Climate models have been run using observed sea surface temperatures to identify biases in the atmospheric circulation. In this work, land surface temperatures are also constrained, which is not routinely done. Experiments include increasing sea surface temperatures, quadrupling atmospheric carbon dioxide and increasing solar radiation. The response of the land surface is then allowed or suppressed, and the global climate is evaluated. Information on how to obtain the model data is also given. The oxygen-18 signal recorded in fossil planktonic foraminifers has been used for over 50 years in many geoscience applications. However, different planktonic foraminifer species from the same sediment core generally yield distinct oxygen-18 signals, as a consequence of their specific living habitat in the water column and along the year. To explicitly take into account this variability for five common planktonic species, we developed the portable module FAME (Foraminifers As Modeled Entities). C-Coupler2 is a new version of C-Coupler with a series of new enhancements. It is ready for use to develop various coupled or nested models. 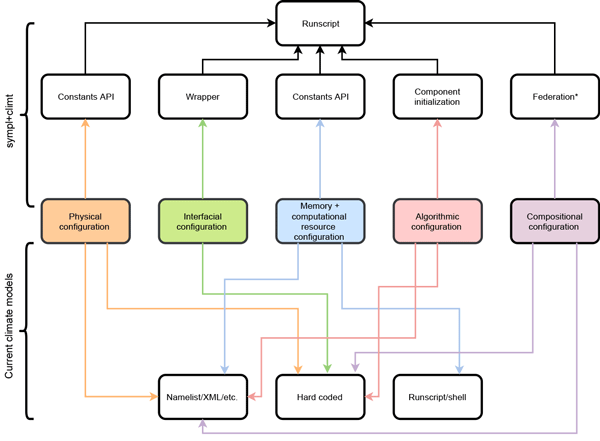 It has passed a number of test cases involving model coupling and nesting, and with various MPI process layouts between component models, and has already been used in several real coupled models. Its source code can be downloaded from https://github.com/C-Coupler-Group/c-coupler-lib. 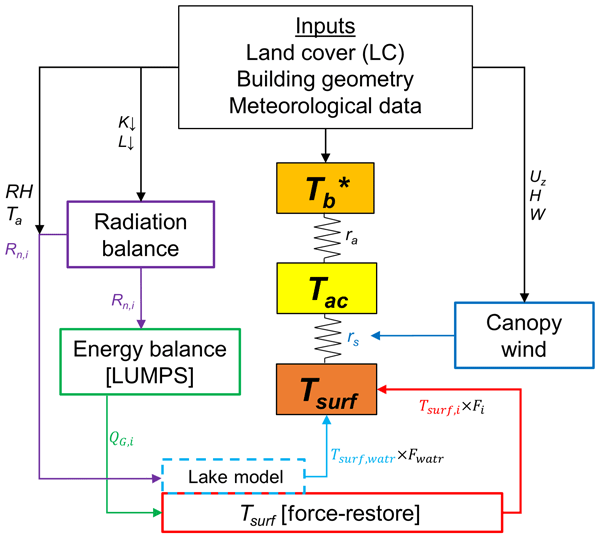 The core of every climate model is the solution of the surface energy balance. Numerical approaches are mandatory to calculate the land's response to solar input. However, different numerical approaches should not affect the physical results. Here we develop a physical approach that determines how the available energy is divided into radiative and heat fluxes. 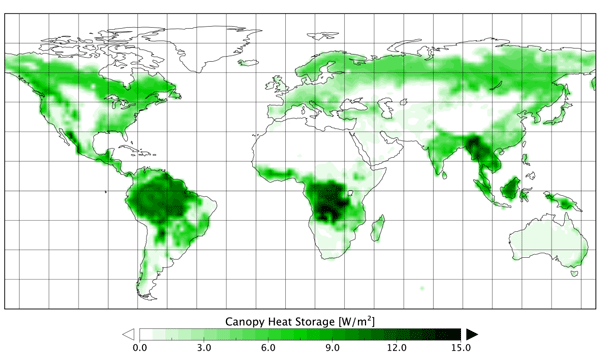 A key element of this scheme is the inclusion of different types of heat storages in the canopy layer. Developing computer models in the earth-system domain is a complex and expensive process that can have a duration measured in years. The supercomputers required to run these models, however, are evolving fast with a proliferation of technologies and associated programming models. 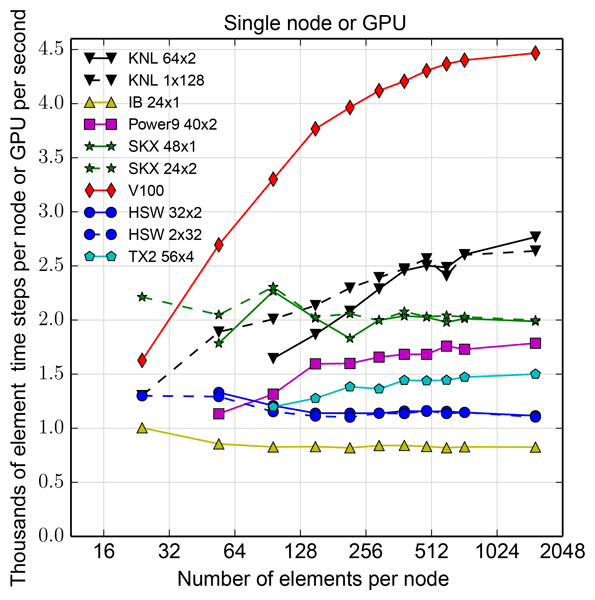 As a result there is a need that models be "performance portable" between different supercomputers. This paper investigates a way of doing this through a separation of the concerns of performance and natural science. Bony, S., Bellon, G., Klocke, D., Sherwood, S., Fermepin, S., and Denvil, S.: Robust direct effect of carbon dioxide on tropical circulation and regional precipitation, Nat. Geosci., 6, 447–451, 2013. Bony, S., Stevens, B., Frierson, D. M. W., Jakob, C., Kageyama, M., Pincus, R., Shepherd, T. G., Sherwood, S. C., Siebesma, A. P., Sobel, A. H., Watanabe, M., and Webb, M. J.: Clouds, circulation and climate sensitivity, Nat. Geosci., 8, 261–268, 2015. 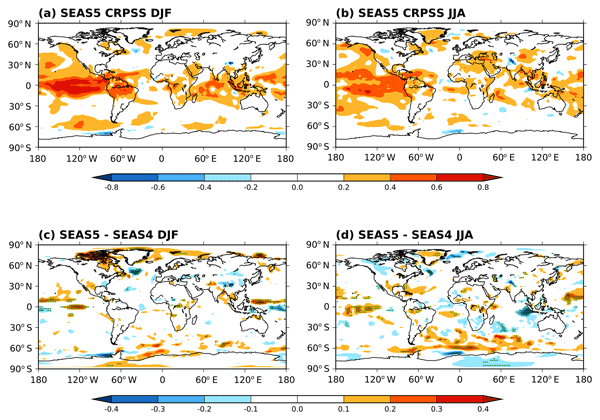 Brasseur, G. and Carlson, D.: Future directions for the World Climate Research Programme, Eos, Transactions American Geophysical Union, 96, https://doi.org/10.1029/2015EO033577, 2015. CMIP Panel: WCRP Coupled Model Intercomparison Project (CMIP), available at: http://www.wcrp-climate.org/index.php/wgcm-cmip/about-cmip, 2016. Crowley, T. J.: Causes of climate change over the past 1000 years, Science, 289, 270–277, 2000. Cubasch, U., Wuebbles, D., Chen, D., Facchini, M. C., Frame, D., Mahowald, N., and Winther, J.-G.: Introduction, in: Climate Change 2013: The Physical Science Basis. Contribution of Working Group I to the Fifth Assessment Report of the Intergovernmental Panel on Climate Change, edited by: Stocker, T. F., Qin, D., Plattner, G.-K., Tignor, M., Allen, S. K., Boschung, J., Nauels, A., Xia, Y., Bex, V., and Midgley, P. M., Cambridge University Press, Cambridge, UK and New York, NY, USA, 2013. Deser, C., Knutti, R., Solomon, S., and Phillips, A. S.: Communication of the role of natural variability in future North American climate, Nat. Clim. Change, 2, 775–779, 2012. Eyring, V., Righi, M., Lauer, A., Evaldsson, M., Wenzel, S., Jones, C., Anav, A., Andrews, O., Cionni, I., Davin, E. L., Deser, C., Ehbrecht, C., Friedlingstein, P., Gleckler, P., Gottschaldt, K.-D., Hagemann, S., Juckes, M., Kindermann, S., Krasting, J., Kunert, D., Levine, R., Loew, A., Mäkelä, J., Martin, G., Mason, E., Phillips, A. S., Read, S., Rio, C., Roehrig, R., Senftleben, D., Sterl, A., van Ulft, L. H., Walton, J., Wang, S., and Williams, K. D.: ESMValTool (v1.0) – a community diagnostic and performance metrics tool for routine evaluation of Earth system models in CMIP, Geosci. Model Dev., 9, 1747–1802, https://doi.org/10.5194/gmd-9-1747-2016, 2016. 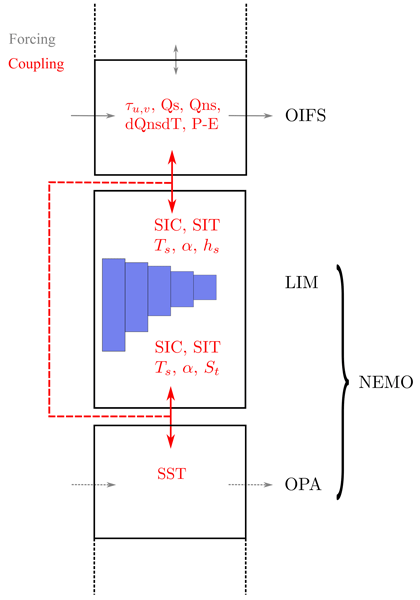 Ferraro, R., Waliser, D. E., Gleckler, P., Taylor, K. E., and Eyring, V.: Evolving obs4MIPs to Support the Sixth Coupled Model Intercomparison Project (CMIP6), B. Am. Meteorol. Soc., https://doi.org/10.1175/BAMS-D-14-00216.1, online first, 2015. Flato, G., Marotzke, J., Abiodun, B., Braconnot, P., Chou, S. C., Collins, W., Cox, P., Driouech, F., Emori, S., Eyring, V., Forest, C., Gleckler, P., Guilyardi, E., Jakob, C., Kattsov, V., Reason, C., and Rummukainen, M.: Evaluation of Climate Models, in: Climate Change 2013: The Physical Science Basis. Contribution of Working Group I to the Fifth Assessment Report of the Intergovernmental Panel on Climate Change, edited by: Stocker, T. F., Qin, D., Plattner, G.-K., Tignor, M., Allen, S. K., Boschung, J., Nauels, A., Xia, Y., Bex, V., and Midgley, P. M., Cambridge University Press, Cambridge, UK and New York, NY, USA, 2013. Gates, W. L., Boyle, J. S., Covey, C., Dease, C. G., Doutriaux, C. M., Drach, R. S., Fiorino, M., Gleckler, P. J., Hnilo, J. J., Marlais, S. M., Phillips, T. J., Potter, G. L., Santer, B. D., Sperber, K. R., Taylor, K. E., and Williams, D. N.: An Overview of the Results of the Atmospheric Model Intercomparison Project (AMIP I), B. Am. Meteorol. Soc., 80, 29–55, 1999. 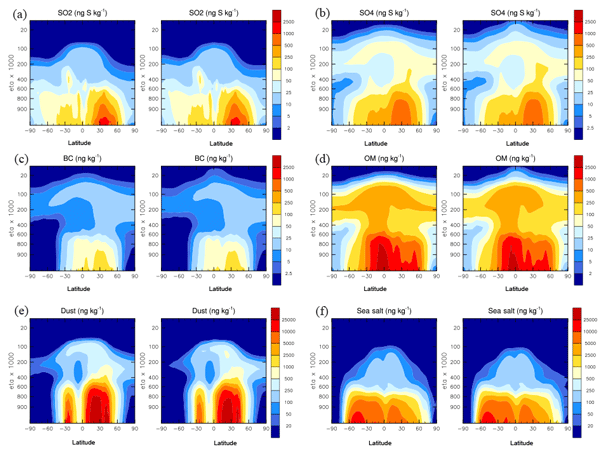 Geoffroy, O., Saint-Martin, D., Olivie, D. J. L., Voldoire, A., Bellon, G., and Tyteca, S.: Transient Climate Response in a Two-Layer Energy-Balance Model. Part I: Analytical Solution and Parameter Calibration Using CMIP5 AOGCM Experiments, J. Climate, 26, 1841–1857, 2013. 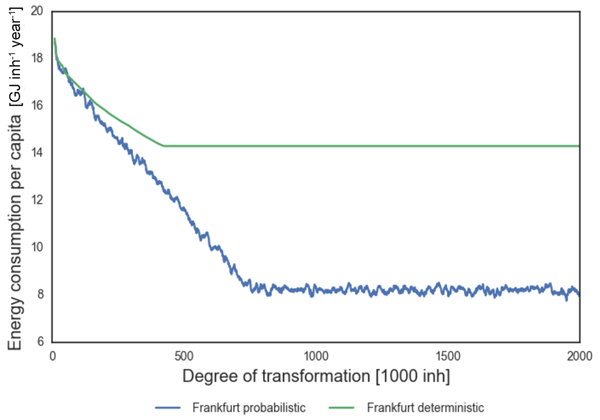 Gleckler, P. J., Doutriaux, C., Durack P. J., Taylor K. E., Zhang, Y., Williams, D. N., Mason, E., and Servonnat, J.: A More Powerful Reality Test for Climate Models, Eos Trans. AGU, https://doi.org/10.1029/2016EO051663, 2016. Gregory, J. and Webb, M.: Tropospheric adjustment induces a cloud component in CO2 forcing, J. Climate, 21, 58–71, 2008. Gregory, J. M.: Long-term effect of volcanic forcing on ocean heat content, Geophys. Res. Lett., 37, L22701, https://doi.org/10.1029/2010gl045507, 2010. Gregory, J. M., Ingram, W. J., Palmer, M. A., Jones, G. S., Stott, P. A., Thorpe, R. B., Lowe, J. A., Johns, T. C., and Williams, K. D.: A new method for diagnosing radiative forcing and climate sensitivity, Geophys. Res. Lett., 31, L03205, https://doi.org/10.1029/2003gl018747, 2004. Gregory, J. M., Bi, D., Collier, M. A., Dix, M. R., Hirst, A. C., Hu, A., Huber, M., Knutti, R., Marsland, S. J., Meinshausen, M., Rashid, H. A., Rotstayn, L. D., Schurer, A., and Church, J. A.: Climate models without preindustrial volcanic forcing underestimate historical ocean thermal expansion, Geophys. Res. Lett., 40, 1600–1604, 2013. Hegerl, G. C., Zwiers, F. W., Braconnot, P., Gillett, N. P., Luo, Y., Marengo Orsini, J. A., Nicholls, N., Penner, J. E., and Stott, P. A.: Understanding and Attributing Climate Change, in: Climate Change 2007: The Physical Science Basis. Contribution of Working Group I to the Fourth Assessment Report of the Intergovernmental Panel on Climate Change, edited by: Solomon, S., Qin, D., Manning, M., Chen, Z., Marquis, M., Averyt, K. B., Tignor, M., and Miller, H. L., Cambridge University Press, Cambridge, UK and New York, NY, USA, 2007. 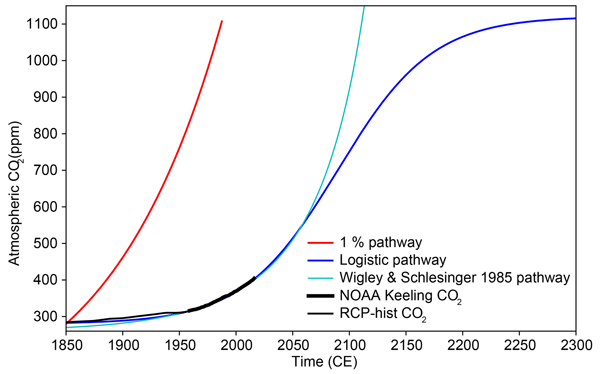 Houghton, R. A.: How well do we know the flux of CO2 from land-use change?, Tellus B, 62, 337–351, 2010. Hurtt, G. C., Chini, L. P., Frolking, S., Betts, R. A., Feddema, J., Fischer, G., Fisk, J. P., Hibbard, K., Houghton, R. A., Janetos, A., Jones, C. D., Kindermann, G., Kinoshita, T., Goldewijk, K. K., Riahi, K., Shevliakova, E., Smith, S., Stehfest, E., Thomson, A., Thornton, P., van Vuuren, D. P., and Wang, Y. P.: Harmonization of land-use scenarios for the period 1500–2100: 600 years of global gridded annual land-use transitions, wood harvest, and resulting secondary lands, Climatic Change, 109, 117–161, 2011. IPCC: Climate Change 2013: The Physical Science Basis. Contribution of Working Group I to the Fifth Assessment Report of the Intergovernmental Panel on Climate Change, Cambridge University Press, Cambridge, UK and New York, NY, USA, 2013. 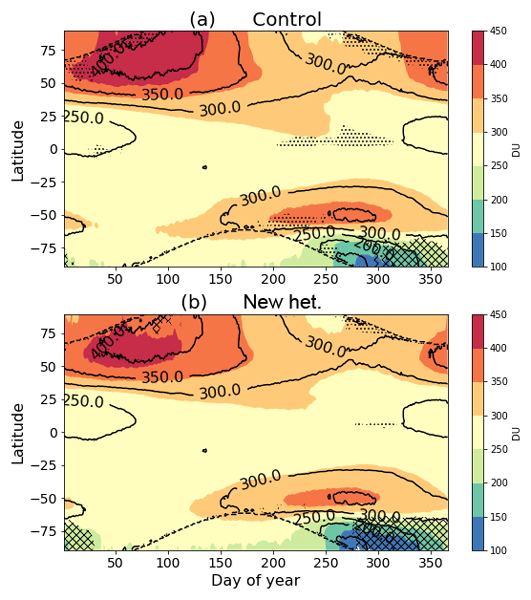 Kamae, Y. and Watanabe, M.: Tropospheric adjustment to increasing CO2: its timescale and the role of land-sea contrast, Clim. Dynam., 41, 3007–3024, 2013. Lawrence, B. N., Balaji, V., Bentley, P., Callaghan, S., DeLuca, C., Denvil, S., Devine, G., Elkington, M., Ford, R. W., Guilyardi, E., Lautenschlager, M., Morgan, M., Moine, M.-P., Murphy, S., Pascoe, C., Ramthun, H., Slavin, P., Steenman-Clark, L., Toussaint, F., Treshansky, A., and Valcke, S.: Describing Earth system simulations with the Metafor CIM, Geosci. Model Dev., 5, 1493–1500, https://doi.org/10.5194/gmd-5-1493-2012, 2012. 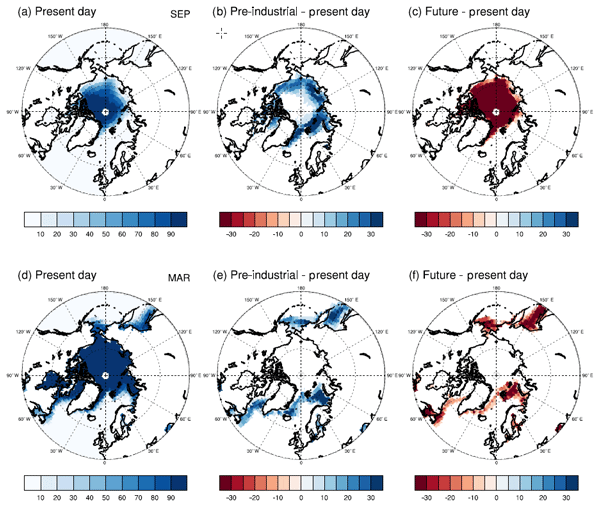 Li, C., Stevens, B., and Marotzke, J.: Eurasian winter cooling in the warming hiatus of 1998–2012, Geophys. Res. Lett., 42, 8131–8139, 2015. Meehl, G. A., Boer, G. J., Covey, C., Latif, M., and Stouffer, R. J.: Intercomparison makes for a better climate model, Eos, Transactions American Geophysical Union, 78, 445–451, 1997. Meehl, G. A., Boer, G. J., Covey, C., Latif, M., and Stouffer, R. J.: The Coupled Model Intercomparison Project (CMIP), B. Am. Meteorol. Soc., 81, 313–318, 2000. Meehl, G. A., Covey, C., Taylor, K. E., Delworth, T., Stouffer, R. J., Latif, M., McAvaney, B., and Mitchell, J. F. B.: THE WCRP CMIP3 Multimodel Dataset: A New Era in Climate Change Research, B. Am. Meteorol. Soc., 88, 1383–1394, 2007. 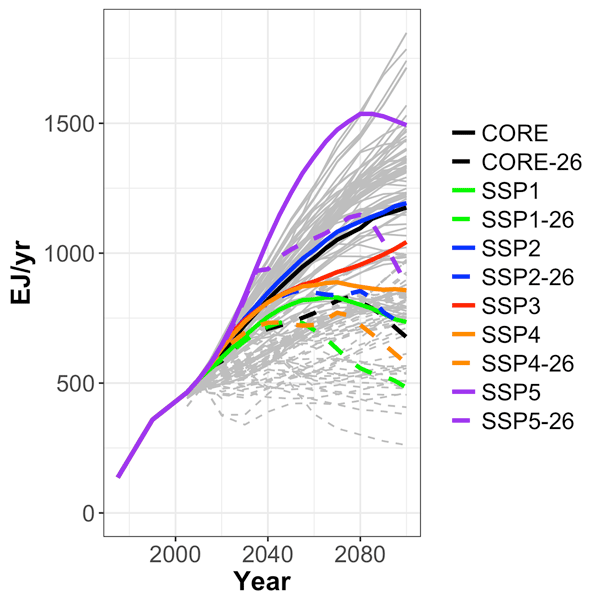 Meehl, G. A., Moss, R., Taylor, K. E., Eyring, V., Stouffer, R. J., Bony, S., and Stevens, B.: Climate Model Intercomparisons: Preparing for the Next Phase, Eos Trans. AGU, 59, 77, https://doi.org/10.1002/2014EO090001, 2014. Moss, R. H., Edmonds, J. A., Hibbard, K. A., Manning, M. R., Rose, S. K., van Vuuren, D. P., Carter, T. R., Emori, S., Kainuma, M., Kram, T., Meehl, G. A., Mitchell, J. F. B., Nakicenovic, N., Riahi, K., Smith, S. J., Stouffer, R. J., Thomson, A. M., Weyant, J. P., and Wilbanks, T. J.: The next generation of scenarios for climate change research and assessment, Nature, 463, 747–756, 2010. Murphy, J. M. and Mitchell, J. F. B.: Transient-Response of the Hadley-Center Coupled Ocean-Atmosphere Model to Increasing Carbon-Dioxide. 2. Spatial and Temporal Structure of Response, J. Climate, 8, 57–80, 1995. Myhre, G., Shindell, D., Breìon, F.-M., Collins, W., Fuglestvedt, J., Huang, J., Koch, D., Lamarque, J.-F., Lee, D., Mendoza, B., Nakajima, T., Robock, A., Stephens, G., Takemura, T., and Zhang, H.: Anthropogenic and Natural Radiative Forcing, in: Climate Change 2013: The Physical Science Basis. Contribution of Working Group I to the Fifth Assessment Report of the Intergovernmental Panel on Climate Change, edited by: Stocker, T. F., Qin, D., Plattner, G.-K., Tignor, M., Allen, S. K., Boschung, J., Nauels, A., Xia, Y., Bex, V., and Midgley, P. M., Cambridge University Press, Cambridge, UK and New York, NY, USA, 2013. O'Neill, B. C., Kriegler, E., Ebi, K. L., Kemp-Benedict, E., Riahi, K., Rothman, D. S., van Ruijven, B. J., van Vuuren, D. P., Birkmann, J., Kok, K., Levy, M., and Solecki, W.: The roads ahead: Narratives for shared socioeconomic pathways describing world futures in the 21st century, Global Environ. Chang., https://doi.org/10.1016/j.gloenvcha.2015.01.004, online first, 2015. 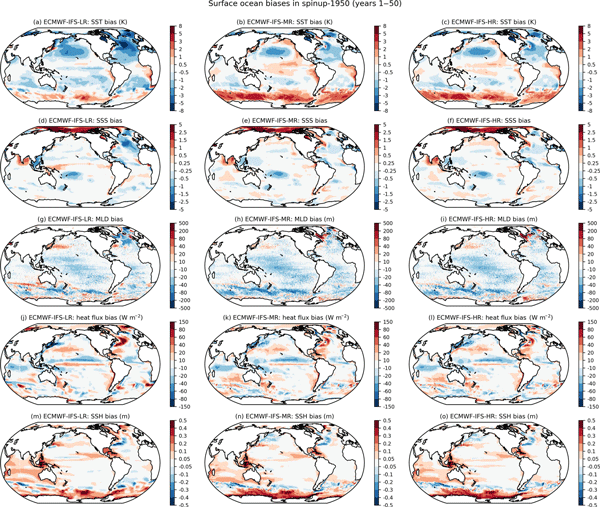 Phillips, A. S., Deser, C., and Fasullo, J.: Evaluating Modes of Variability in Climate Models, Eos Trans. AGU, 95, 453–455, 2014. Rauser, F., Gleckler, P., and Marotzke, J.: Rethinking the Default Construction of Multimodel Climate Ensembles, B. Am. Meteorol. Soc., 96, 911–919, 2014. Sentman, L. T., Shevliakova, E., Stouffer, R. J., and Malyshev, S.: Time Scales of Terrestrial Carbon Response Related to Land-Use Application: Implications for Initializing an Earth System Model, Earth Interact., 15, 1–16, 2011. Sherwood, S. C., Bony, S., Boucher, O., Bretherton, C., Forster, P. M., Gregory, J. M., and Stevens, B.: Adjustments in the Forcing-Feedback Framework for Understanding Climate Change, B. Am. Meteorol. Soc., 96, 217–228, 2015. Stevens, B.: Rethinking the Lower Bound on Aerosol Radiative Forcing, J. Climate, 28, 4794–4819, 2015. Stott, P. A., Mitchell, J. F. B., Allen, M. R., Delworth, T. L., Gregory, J. M., Meehl, G. A., and Santer, B. D.: Observational constraints on past attributable warming and predictions of future global warming, J. Climate, 19, 3055–3069, 2006. Stouffer, R. J., Weaver, A. J., and Eby, M.: A method for obtaining pre-twentieth century initial conditions for use in climate change studies, Clim. Dynam., 23, 327–339, 2004. Stouffer, R. J., Eyring, V., Meehl, G. A., Bony, S., Senior, C., Stevens, B., and Taylor, K. E.: CMIP5 Scientific Gaps and Recommendations for CMIP6, B. Am. Meteorol. Soc., submitted, 2015. Taylor, K. E., Stouffer, R. J., and Meehl, G. A.: A Summary of the CMIP5 Experiment Design, available at: http://cmip.llnl.gov/cmip5/docs/Taylor_CMIP5_design.pdf (last access: 13 May 2016), 2009. Taylor, K. E., Stouffer, R. J., and Meehl, G. A.: An Overview of Cmip5 and the Experiment Design, B. Am. Meteorol. Soc., 93, 485–498, 2012. Teixeira, J., Waliser, D., Ferraro, R., Gleckler, P., Lee, T., and Potter, G.: Satellite Observations for CMIP5: The Genesis of Obs4MIPs, B. Am. Meteorol. Soc., 95, 1329–1334, 2014. Trenberth, K. and Asrar, G.: Challenges and Opportunities in Water Cycle Research: WCRP Contributions, Surv. Geophys., 35, 515–532, 2014.
van Vuuren, D. P., Edmonds, J., Kainuma, M., Riahi, K., Thomson, A., Hibbard, K., Hurtt, G. C., Kram, T., Krey, V., Lamarque, J. F., Masui, T., Meinshausen, M., Nakicenovic, N., Smith, S. J., and Rose, S. K.: The representative concentration pathways: an overview, Climatic Change, 109, 5–31, 2011. 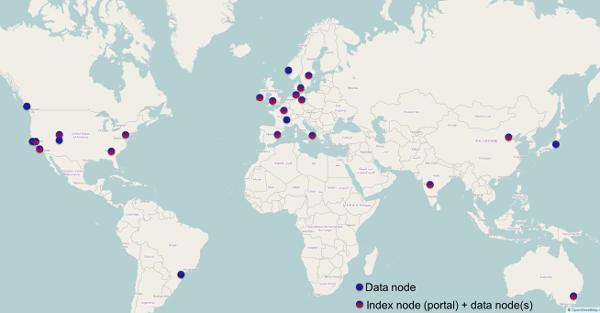 Williams, D. N., Balaji, V., Cinquini, L., Denvil, S., Duffy, D., Evans, B., Ferraro, R., Hansen, R., Lautenschlager, M., and Trenham, C.: A Global Repository for Planet-Sized Experiments and Observations, B. Am. Meteorol. Soc., https://doi.org/10.1175/bams-d-15-00132.1, online first, 2015. Williams, K. and Webb, M.: A quantitative performance assessment of cloud regimes in climate models, Clim. Dynam., 33, 141–157, 2009. The objective of CMIP is to better understand past, present, and future climate change in a multi-model context. CMIP's increasing importance and scope is a tremendous success story, but the need to address an ever-expanding range of scientific questions arising from more and more research communities has made it necessary to revise the organization of CMIP. In response to these challenges, we have adopted a more federated structure for the sixth phase of CMIP (i.e. CMIP6) and subsequent phases.